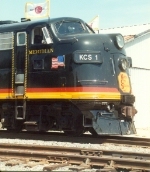 Description: KCS Officer Special No. 801-16: KCS FP9A "Meridian", KCS FP9A 4 "Vicksburg", KCS 1887 Arthur E. Stilwell, KCS 98 Kansas City, Osage River 800610, and Sierra Hotel 800275. Description: The KCS office train was at Knoche one day when I happened to be going past. This is long before the Belle scheme was resurrected. Description: KCS 1 on a fright date is just a guess. Description: I caught the KCS business train at Knoche on Sunday while waiting on freight. The Choteau Trafficway was easy to get to, and I could park a bobtail tractor nearby, so I went train watching. Turned intot a good day. A coal train headed south on the KCS makes its way though the yard. Description: In a distant view seen from the Choteau Trafficway, the KCS executive train sits at Knoche Yard behind A-B-A F units. 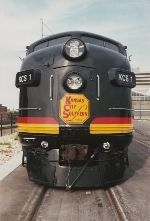 Description: Cab shot of KCS 1. Originally named "Meridian", it now bears the heritage Belle scheme, and named "Shreveport". Description: while kids were looking for Santa, I was looking for a F-Unit...and I found it! Description: KCS 1 crossing the CN-IC Switch Tender heading to KCs High Oak Yard. Description: KCS Westbound Holiday Express passing through Ada, La. Description: KCS Westbound Holiday Express passing over a low lying wooden trestle at Sibley, La. Description: KCS Westbound Holiday Express passing through Fords, La. Description: KCS 1 takes a break at KCS High Oak Yard to take on water after dropping off KCS Holiday Express in the storage track for tonight's visitors. Description: Belle holds the siding at CP West Brashear until an eastbound BNSF haulage train clears. Description: KCS 1, Southern Belle, takes KCS executives across the Meridian Sub for inspection after several track work projects have been completed. Description: Power for the Santa Clause train is parked in LaPlace, LA. 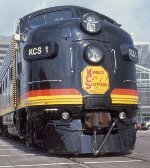 Description: The decision to catch the KCS Holliday Express in Blue Springs pays off right here. Because the Southern Belle doesn't come to Union Station with the Holliday Express.